Expression of MHC molecules on mCP-CML and mBC-CML LSCs increases in the alloimmune environment, independently of cognate TCR-MHC interactions. MHCII expression on WT and MHCII–/– mBC-CML (A, left) or mCP-CML (A, right) LSCs harvested from mice transplanted with leukemia cells but without GVH-inducing T cells. (B) Irradiated B6 mice were reconstituted with C3H.SW BM and CD4 or CD8 T cells and either mBC-CML or mCP-CML. Mice were sacrificed between days 10 and 14, and LSCs were analyzed for MHCI and MHCII expression. Representative data from at least 3 independent experiments are shown. (C) Irradiated B6 mice were reconstituted with C3H.SW BM with B6 B2m–/– mBC-CML (MHCI–) and C3H.SW CD8 cells; B6 MHCII–/– mBC-CML (MHCII–) and C3H.SW CD4 cells; or WT B6 mBC-CML and C3H.SW CD4 or CD8 cells. On day 15 after BMT, splenocytes were harvested, and MHCI and MHCII expression on mBC-CML LSCs was assessed. Similar MHC upregulation was noted on LSCs harvested from BM (data not shown). Data are representative of 3 independent experiments. (D) Mice were transplanted as in C, except with B2m–/– or MHCII–/– mCP-CML cells. 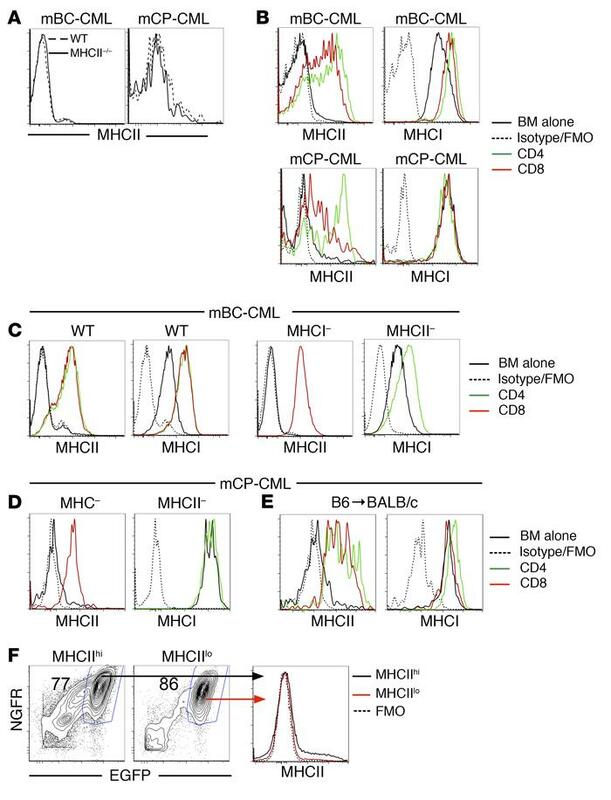 MHC upregulation was also independent of TCR-MHC interactions. (E) Irradiated BALB/c mice were reconstituted with B6 BM and B6 mCP-CML with no T cells or with B6 CD4 or CD8 cells. MHCII and MHCI were upregulated on splenic mCP-CML LSCs on day 15 after BMT. Similar MHC upregulation was seen in BM LSCs (data not shown). (F) MHCIIhi and MHCIIlo mBC-CML LSCs from mice undergoing a GVHD response (C3H.SW→B6 model with GVH induced by CD4 cells) were sort purified and transferred into sublethally irradiated B6 mice. Both populations transferred disease (F, left panels). Progeny of sorted MHCIIhi and MHCIIlo mBC-CML cells recovered 15 days after transfer were MHCIIlo (F, right panel). FMO, fluorescence minus one.